When I get a new laptop, the battery life time at the start is OK. But this do not last. The last few laptops gave me a feeling that within a year, the life time is just a fraction of what it used to be, and it slowly become painful to use the laptop without power connected all the time. Because of this, when I got a new Thinkpad X230 laptop about two years ago, I decided to monitor its battery state to have more hard facts when the battery started to fail. First I tried to find a sensible Debian package to record the battery status, assuming that this must be a problem already handled by someone else. I found battery-stats, which collects statistics from the battery, but it was completely broken. I sent a few suggestions to the maintainer, but decided to write my own collector as a shell script while I waited for feedback from him. Via a blog post about the battery development on a MacBook Air I also discovered batlog, not available in Debian. energy_full energy_full_design energy_now cycle_count status"
# when several log processes run in parallel. The script is called when the power management system detect a change in the power status (power plug in or out), and when going into and out of hibernation and suspend. In addition, it collect a value every 10 minutes. This make it possible for me know when the battery is discharging, charging and how the maximum charge change over time. The code for the Debian package is now available on github. I wrote a small script to create a graph of the charge development over time. This graph depicted above show the slow death of my laptop battery. But why is this happening? Why are my laptop batteries always dying in a year or two, while the batteries of space probes and satellites keep working year after year. If we are to believe Battery University, the cause is me charging the battery whenever I have a chance, and the fix is to not charge the Lithium-ion batteries to 100% all the time, but to stay below 90% of full charge most of the time. I've been told that the Tesla electric cars limit the charge of their batteries to 80%, with the option to charge to 100% when preparing for a longer trip (not that I would want a car like Tesla where rights to privacy is abandoned, but that is another story), which I guess is the option we should have for laptops on Linux too. Is there a good and generic way with Linux to tell the battery to stop charging at 80%, unless requested to charge to 100% once in preparation for a longer trip? I found one recipe on askubuntu for Ubuntu to limit charging on Thinkpad to 80%, but could not get it to work (kernel module refused to load). I wonder why the battery capacity was reported to be more than 100% at the start. I also wonder why the "full capacity" increases some times, and if it is possible to repeat the process to get the battery back to design capacity. And I wonder if the discharge and charge speed change over time, or if this stay the same. 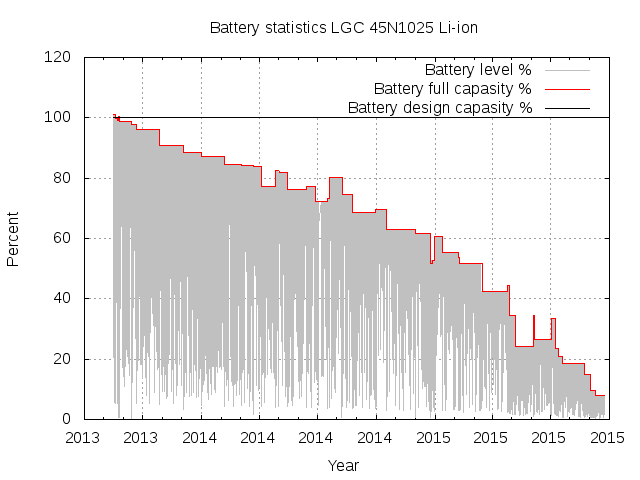 I did not yet try to write a tool to calculate the derivative values of the battery level, but suspect some interesting insights might be learned from those. Update 2015-09-24: I got a tip to install the packages acpi-call-dkms and tlp (unfortunately missing in Debian stable) packages instead of the tp-smapi-dkms package I had tried to use initially, and use 'tlp setcharge 40 80' to change when charging start and stop. I've done so now, but expect my existing battery is toast and need to be replaced. The proposal is unfortunately Thinkpad specific. Creating a good looking book cover proved harder than I expected. 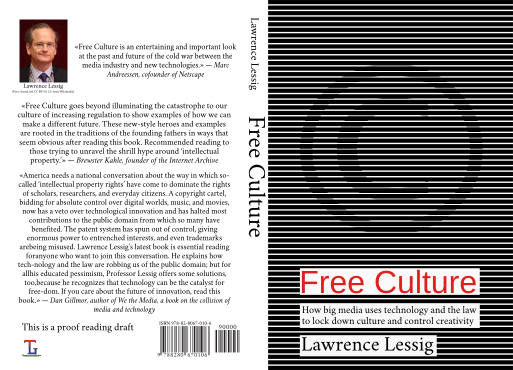 I wanted to create a cover looking similar to the original cover of the Free Culture book we are translating to Norwegian, and I wanted it in vector format for high resolution printing. But my inkscape knowledge were not nearly good enough to pull that off. But thanks to the great inkscape community, I was able to wrap up the cover yesterday evening. I asked on the #inkscape IRC channel on Freenode for help and clues, and Marc Jeanmougin (Mc-) volunteered to try to recreate it based on the PDF of the cover from the HTML version. Not only did he create a SVG document with the original and his vector version side by side, he even provided an instruction video explaining how he did it. But the instruction video is not easy to follow for an untrained inkscape user. The video is a recording on how he did it, and he is obviously very experienced as the menu selections are very quick and he mentioned on IRC that he did use some keyboard shortcuts that can't be seen on the video, but it give a good idea about the inkscape operations to use to create the stripes with the embossed copyright sign in the center. I am not quite sure about the text on the back, but guess it will do. I picked three quotes from the official site for the book, and hope it will work to trigger the interest of potential readers. The Norwegian cover will look the same, but with the texts and bar code replaced with the Norwegian version. The book is very close to being ready for publication, and I expect to upload the final draft to Lulu in the next few days and order a final proof reading copy to verify that everything look like it should before allowing everyone to order their own copy of Free Culture, in English or Norwegian Bokmål. I'm waiting to give the the productive proof readers a chance to complete their work.